You can help the clean up the oil spill in the Gulf! Cindy Cho Aveda has hooked with the Matter of Trust organization (www.matteroftrust.org) to help the efforts being made to clean up the oil spill in the Gulf. 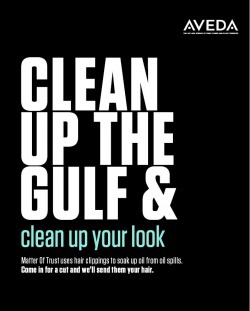 We will be sending all the leftover hair clippings from haircuts to Matter of Trust to be made into hair mats that are used to clean oil spills. And it doesn't matter how long the hair is! It can be just a trim and still be used! We will also be collecting donations of nylons and furs, as they are also used to make oil spill mats. Anyone that makes a haircut appointment for this event will receive 20% off of their cut and a free gift.